Are your rain gutters not harvesting water as they should? Is the rainwater harvesting system that you installed yourself not working as you expected it to? Call San Antonio Rain Gutter Pros. We will install a rain harvesting system that will work for your unique needs. As the name implies, rainwater harvesting is used for storing, collecting and using rainwater for use such as irrigation. Rainwater normally runs though rain gutters and into your yard or the street. The water itself is collected in a storage container such as a cistern or storage tank. Property owners can save it for later use. For example, a homeowner can use it to water his plants. Commercial property owners can use it to conserve their water budget. Rainwater is not treated which means that it is not suitable for drinking. If you plan on doing the same, a simple barrel at the end of your downspout will not be as effective. If it is not covered, it could end up as a breeding ground for mosquitoes. A water storage system from San Antonio Rain Gutter Pros is just what you need to harvest precious rainwater. We offer storage tanks that are made from a variety of durable materials from plastic containers to metal tanks. Our solutions are designed to reduce evaporation loss, algae growth and keep your rainwater clean. Plastic Tanks – Plastic rainwater tanks are perfect for the home or commercial property owner on a budget. The free standing tanks are low cost on purchase and installation. In addition, they require almost no excavation. Stainless Steel – If you are looking for quality rainwater harvesting tanks for your property, the stainless steel variety is for you. These tanks don’t rust which means that they won’t contaminate stored water. They are durable and will last you for a long while. Plus they are attractive to look at. You never know when you might have to face a water shortage. There is peace of mind knowing that you have gallons of rainwater available for use at your site or home. San Antonio Rain Gutter Pros can make it easier and convenient for you to store water on a rainy day. Who can say that they wash their clothes with rainwater? You can, after San Antonio Rain Gutter Pros makes rainwater harvesting possible for you. Rainwater is low in minerals. This makes it perfect for use for laundry. Use it to wash your dishes or to water delicate plants. Recycling rainwater is one of the most eco-friendly practices out there. It lowers a business’s and your carbon footprint while keeping costs low. Rainwater isn’t regulated by municipal regulations for water restrictions. Your landscaping efforts don’t have to go to waste when droughts hit. 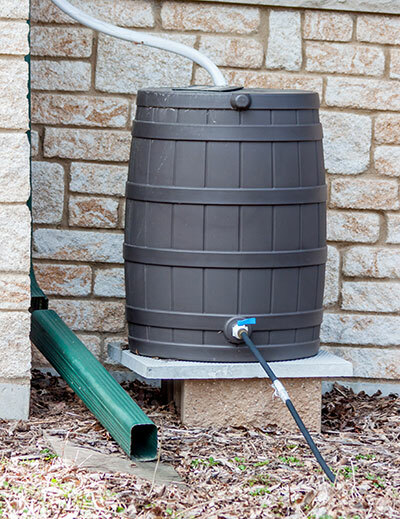 Use stored rainwater to complete your garden. Rainwater harvesting systems need to be cleaned and maintained on a regular basis to ensure that the water does not get contaminated. Our experts can do it for you. Contact us at (insert number) to book a free consultation. Rainwater harvesting is a practical solution to serious water shortages. Contact the professional experts at San Antonio Rain Gutter Pros and see your water bill drop.